Are you new to Lake Louise and a bit intimidated by its size and complexity? Are you alone and would like some company on the slopes? Do members of your group have very different skiing or riding abilities? 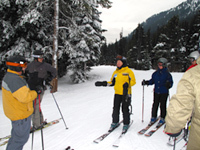 Why not join the Ski Friends for a FREE tour geared to YOUR level of expertise? For more detailed information click on "About the Tours". Heritage tours were initiated in 2010 as a means of introducing both newcomers and returning guests to the geology, biology and human history of Lake Louise. The tour is suitable for all skiing levels and is an ideal way to have an informative and restful day on the slopes. Heritage Tours are offered when trained guides are available. Note: If you have a group interested in participating in a Heritage Tour and wish to ensure that a tour will be available, we may be able to schedule a private tour for you. Please contact Lake Louise Group Sales at llgroups@skilouise.com or call 403 522 1341. Meet at the Ski Friends Tour sign located at the left of the lower main deck area as you look at the mountain. Look for the yellow Ski Friends jackets! You are visitor number 15879 since July 2012. TOP | HOME | CONTACT Hosted by - Original design: © 2003 Trac Data.net. All rights reserved.